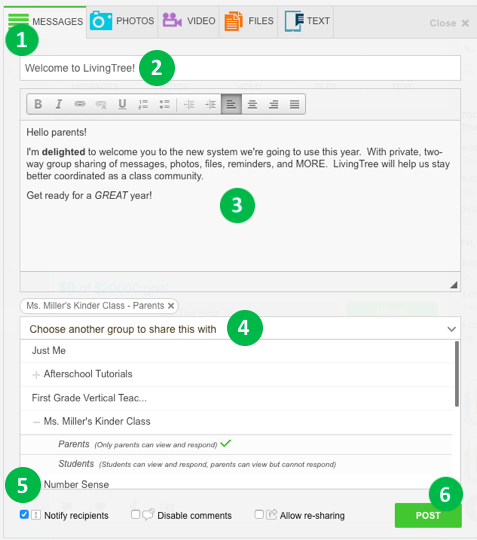 Jumpstart your community’s LivingTree experience by sharing with parents and/or students right away! Recipients will see content that you’ve shared with them as soon as they log in. Click on the share buttons (Messages, Photos, Video, Files) to begin, depending on the type of post you want to share. Add a subject line for your post. The subject line you enter will be the subject in the email notification. Type your message in the message field. You can use the formatting buttons if you’d like to get creative with your post! Click the dropdown menu to select recipients. After selecting your school, the list of groups/departments in your school’s network will appear. If you want to share your post with everyone (staff and parents), just click the parents option – e.g., St. Edward’s Elementary Parents. Notifications are sent via email and mobile (through the LivingTree app). You can also disable comments for your post, and ‘allow re-sharing’ (this allows recipients to re-share your post with their LivingTree groups). Click ‘Post’ and your message is complete! Recipients will see your post in their Conversations stream.